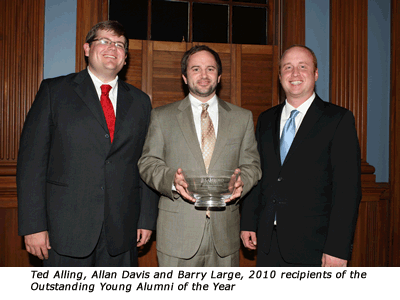 Samford University is accepting nominations for its 2011 Alumni of the Year and Outstanding Young Alumnus honors through April 10. The 2011 recipients will be honored during Homecoming weekend Oct. 28-30. Nominees for Alumni of the Year recognition should be distinguished in their professional careers, community and church involvement, and in their ongoing service to and financial relationship with Samford University. Recognition can be for lifetime achievement or for a significant achievement during the previous year. To be eligible, graduates must have completed at least one Samford degree at least ten years prior to selection. Recipients may have earned more than one degree from Samford, but the first degree earned shall be used to determine eligibility. This will be the third year for the university to present the Outstanding Young Alumni awards to graduates from the last 10 years. Again, nominees should be distinguished in their professional careers, community and church involvement, and in their ongoing support of Samford University. To be eligible, graduates must have completed at least one Samford degree within the last 10 years. Recipients may have earned more than one degree from Samford, but the first degree earned shall be used to determine eligibility. Nominations must be submitted in writing.